Around a bend in the river from Chiswick Bridge are the two Barnes Railway Bridges. 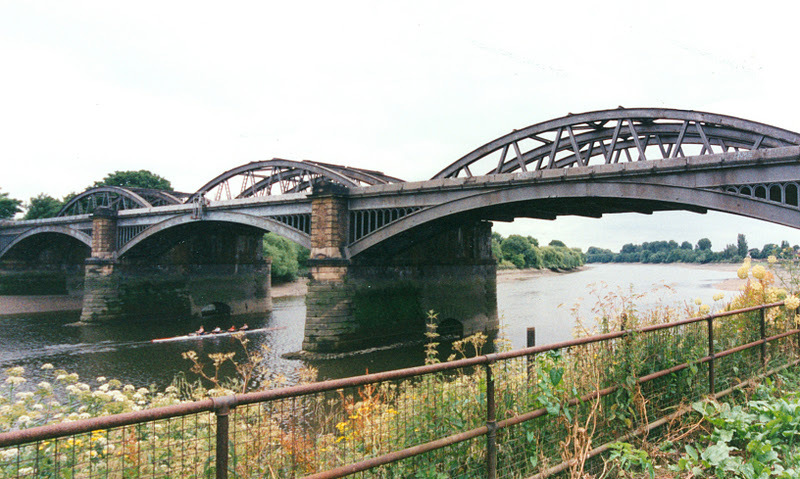 The first bridge is a steel deck arch designed by Joseph Locke in 1849 (who also designed the Richmond Railway Bridge). Concerns about the bridge's safety prompted the London and South Western Railway to build a three span steel bowstring arch beside it in 1895. The existing stone piers were widened, steel arch segments were shop fabricated, brought to the bridge site by barge, lifted, and placed onto the piers. This bridge has two sets of tracks as well as pedestrian walkways. It is one of the few railway bridges on the Thames that allows for foot traffic. In fact, the walkways were strengthened to support all the people who crowd onto them to watch the Oxford and Cambridge Boat Race in March. The race begins downstream at Putney Bridge and ends upstream just before the Chiswick Bridge. Racing along this bend in the river is considered challenging because of the changing winds and currents. This is a pleasant part of the Thames, surrounded by elegant 18th and 19th century mansions, the Duke's Meadows, and a nature preserve. It is hard to imagine that just fifty years ago it was so polluted that it was considered a dead river. Thames River Bridges: Barnes Railway Bridge by Mark Yashinsky is licensed under a Creative Commons Attribution-NonCommercial-ShareAlike 3.0 United States License.